Right now, our county is under threat from several invasive species that will have an significant impact on our ecosystem. It is important for the public to be able to recognize these species, and more importantly, know simple steps they can take to limit or prevent their spread. 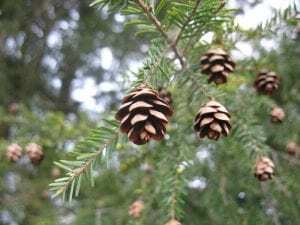 NYS Hemlock Initiative – Newsletter available from CALS (Cornell College of Ag and Life Sciences). Click image for more! Emerald Ash Borer– A wood boring beetle that threatens all ash trees of New York State. Roughly 10-15% of all trees in Cayuga County are ash trees, including many street and park trees. Found in Cayuga County. Hemlock Wooly Adelgid– An insect that threatens the Eastern Hemlock trees- a tree extremely common along lakes and streams, and a unique and valuable part of our ecosystem. Found in Cayuga County. Hydrilla– A rapidly growing aquatic plant that forms thick, dense mats. Found in Cayuga Lake Inlet, Ithaca NY. Click here for a printable Hydrilla Fact sheet. Asian Clams– A clam that produces nitrogen that can lead to increased algae. Found in Owasco Lake. Water Chestnut– Another aquatic plant that produces thick, dense mats. Found all around New York State.